akapad Paper Sponge white, hard | Aka-Products | Solvents, Chemicals & Additives | Kremer Pigments Inc.
For dry cleaning. Wishab is used for convenient, safe dry cleaning of surface soiling on walls, ceilings, pictures, frescoes, mural paintings, wallpaper, paper, textiles, coats of paint etc. The sponge works by ab- sorbing dirt particles, then crumbling off to avoid friction or polishing the affected surface. It is often used in advance of a wet treatment to prevent dirt being washed into cracks, or on surfaces that cannot be cleaned with water. It has been used with particular success in the cleaning of fire damages. 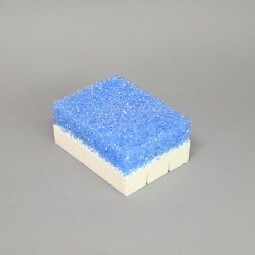 The Wishab paper sponge consists of a blue grip and an attached cleaning sponge (active ingredi- ent). Use depends on the type and sensitivity of the base surface. Customer evaluation for "akapad Paper Sponge white, hard"